John is also the Clinical Director for FIFO Focus, a group of specialist psychologists and behavioural consultants work with employers and individuals to create happier, healthier FIFO workplaces. In collaboration with THE resources HUB (and Dani Tamati) our FIFO Development initiative is a finalist for the 'Community Interaction' category at the upcoming Australian Mining Prospect Awards. It’s feels great when the work you do to support the FIFO community gets recognised. See you soon Sydney!! People living in rural and remote areas (specifically, Modified Monash Model regions 4 to 7) are now able to gain access to telehealth psychology sessions. With recent changes to the requirements, it is now possible to have access to up to ten Medicare rebateable sessions in each calendar year with a care plan from your GP in place. Delta Psychology is fully equipped to provide assistance if you live in one of the areas covered by the telehealth scheme. If you would like to make an appointment at a time that suits you, please call us on (08) 9403 4777, or click here to make one online. 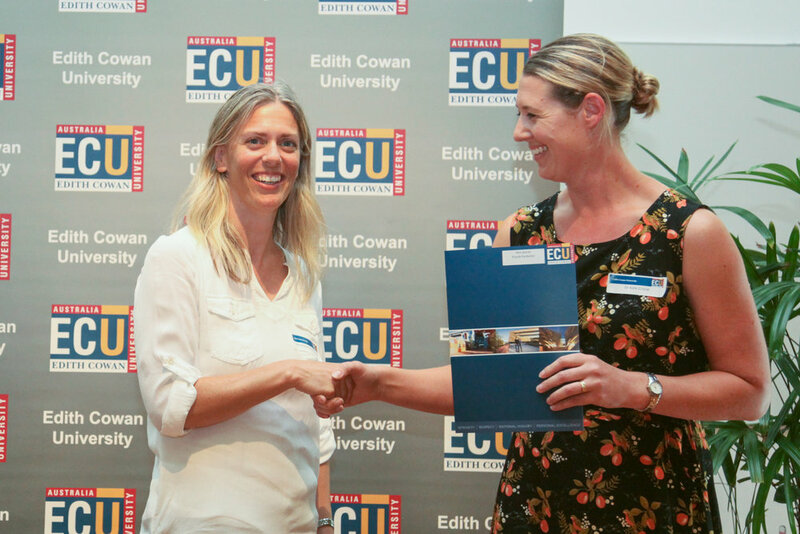 Astrid Plumb-Parlevliet being presented with the Delta Psychology Prize by Dr Kate Cruise at the recent ECU Awards Night. We would like to congratulate Astrid Plumb-Parlevliet on winning the 2017 Delta Psychology Prize. This prize is awarded to the first year student in one of the Clinical Psychology courses (MPsych, MPsych/PhD) who exhibits the best practical clinical skills in their practicum at the Edith Cowan University (ECU) Psychological Services Centre. We wish Astrid all the best for her future endeavours! We are very happy to announce that Dr Kate Cruise is the winner of the 2016 Delta Psychology Prize. In addition to extensive teaching, research, and work experience, Kate already holds a BA (Hons) Psychology and a PhD (Psychology) from the University of Tasmania, and is currently in her final semester of a Master of Clinical Psychology at ECU. She has found this to be a challenging and rewarding experience, and has been pushed outside of her comfort zone by both the coursework and the practical components of the course which helped her to develop both professionally and personally. Kate cannot speak highly enough of her experiences with the ECU Psychological Services Centre and the supervision that she has received. This experience has provided her with a strong foundation to develop as a Psychologist. Kate’s aim following graduation is to grab hold of an employment opportunity that will allow her to start the Clinical Psychology Registrar program. She looks forward to then seeing what the future holds. The FACE Network - the FIFO Australian Community of Excellence Network - is a non-profit association of researchers, workers, policy makers, service providers and community members interested in all elements of Fly-In Fly-Out (FIFO), long-distance commute work, health and lifestyle usually related to mineral and energy exploration, construction or production. Its purpose is to promote safe, supportive FIFO work practices and lifestyle informed by evidence-based research and to influence policy. Delta Psychology has extensive experience with FIFO workers and their families, and we know that FIFO is a lifestyle that presents particular challenges in addition to the benefits, and that the well-being of FIFO workers and their families is influenced by a complex range of factors. We are not only committed to supporting FIFO workers and their families in times of need, we acknowledge the importance of organisations such as the FACE Network and are proud to be an inaugural sponsor. If you would like more information on the FACE Network, please click here. We are now pleased to offer clinical psychology services to people in rural and remote locations, Fly-in Fly-out (FIFO) workers and their families – in Australia or around the world. This includes Skype consultations, e-mails, or a combination of the two. Unfortunately, however, these services do not currently attract a Medicare rebate. If you are interested in finding out more about E-therapy, please click here. Delta Psychology is a proud sponsor of the Delta Psychology Prize, which is awarded to the student in the 1st year of the Clinical Psychology courses (MPsych, MPsych/PhD) at Edith Cowan University who exhibits the best practical clinical skills. The winner of the 2014 prize was Ms Kate Pearson, who was presented with her award by Dr John Forbes at a ceremony at Joondalup Resort on the 18th of March 2015. We are pleased to offer current and new clients the ability to make their own appointments with whichever psychologist you choose. You can access this facility by clicking on the top right-hand menu button. Of course, you are always welcome to call your psychologist directly if you would prefer.